Do you have any friends or someone in your family that you wish you were closer to? A sibling or parent? With a long checkered history of not getting along very well, misunderstandings or competition, at least from someone’s point of view? This may be true for a daughter or a son, an uncle, or a friendship that’s gone off the rails a couple of times. I’m probably more optimistic than most, reaching out and hoping that this time will be different (or better) all right. Then, something happens, some words spoken in the heat of the moment, an email with a nasty twist and suddenly you feel like that Tarot card, the Ten of Swords. You know the one–the soldier is lying in a pool of blood with ten swords stuck at various angles into his back. 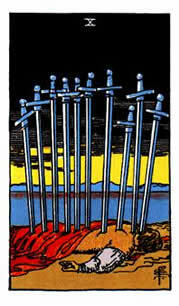 These Ten of Swords hits come along once in a while, maybe even years apart but they are unmistakeable when they occur. It feels like a swift blow to the heart and one is left breathless with the depth of pain that comes suddenly out of the blue. If you’re lucky, you’ll have fewer than the fingers on one hand to chalk up during your lifetime; but if you’re unlucky, there might be more. Well, this happened to me last night and it caught me unawares because I thought things had been going along rather well with this particular person for quite awhile. Because it was so unexpected, I had to re-read the email a couple of times, close my laptop and stop myself from feeling hurt and furious at the same time. Instead of obsessing over it (OCD, remember?) and machinating about it all night, I decided to do something different for once. Since there’s nothing that can be done to change the past, why waste time feeling bad about what can’t be altered? I mean, if I felt bad about things THEN, why torture myself with feeling bad about them again NOW??? IF ONLY. Well, there’s no “if only.” It was what it was. And now, it is what it is. That’s all. Instead of ruining my night, I figured out how to get over it firmly and quickly, without having to escalate it into a confrontation or to ignore it completely. How? By remembering the Aesop’s Fable about the Scorpion and the Frog. The ever-optimistic frog believes the Scorpion when he promises that he won’t sting the frog if only the frog will agree to carry the scorpion on his back across the pond. The Scorpion stings him anyway, halfway across, paralyzing the frog and when asked “why?” the Scorpion replies, “because that’s who I am.” And that’s exactly, EXACTLY the case here! This person is a scorpion, just being who they are, not being able to go against their character. It could not be otherwise for them to act as they do. So, why take it personally? There is no point in spending a whit more whiff of energy feeling bad, wondering why, trying to figure out whether to reply or to ignore it, feeling like a fool for having reached out to them before. All that is GONE, baby, GONE. They are the scorpion. Just being who they are. End of story. So glad you think so! Thanks, Suz. 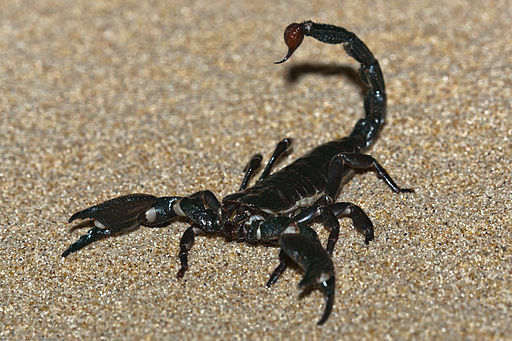 I have a feeling everyone may have a scorpion or two lurking around. We can’t do anything about their actions, but we surely can do something about how we choose to react!